This is a great dish for a picnic or for a different kind of offering at a potluck. You can also use other grains or small pastas instead of the freekeh–Israeli or Mediterranean couscous is nice, as is farro, barley, or another firm grain. Freekeh (pronounced free-kah and is sometimes called farik) is wheat that was harvested while young and green. It's roasted over open fire, leaving the firm, slightly chewy inside grain. The flavor is described as earthy, nutty, and slightly smoky. While freekeh has been a staple in Middle Eastern diets for centuries, it has been gaining popularity alongside other grains like well-known quinoa. However, freekeh certainly stands out with its impressive nutrient content. It's low in fat but high in protein and fiber. Both protein and fiber help keep you fuller for longer, which can help anyone focus on their weight management or weight loss goal. Its lower glycemic index (wholegrain freekeh GI = 43) also makes it a great choice for people managing diabetes or those just trying to keep their blood sugar steady. To top it off, this delicious grain is also high in iron, calcium, and zinc, and acts like a prebiotic, promoting the growth of good bacteria in your digestive system. Yet it's important to note that freekeh is not a gluten-free option since it is a wheat product. Heat a large skillet over medium-high heat. Add the oil. Add the mushrooms and shallots, season with salt and pepper, and sauté for about 8 minutes until the liquid has evaporated and the mushrooms have turned nicely browned. Add the broccoli rabe and red pepper flakes and sauté for another 10 minutes or so until the broccoli rabe is crisp-tender. 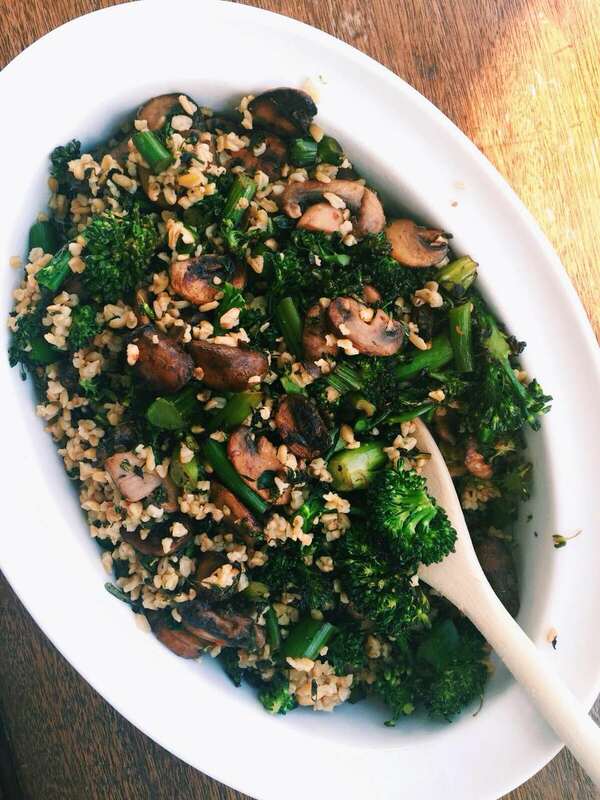 Turn the vegetable mixture into a serving bowl and add the freekeh. Toss, then taste and adjust seasonings, and serve hot.